Disney’s live-action Beauty and the Beast isn’t bad. How could it be? It’s basically a remake of one of the greatest animated movies of all time. It’s when it tries to be different that it stumbles, and those problems drag down the good parts where it gets hard to overlook its flaws, making you wonder if you should just watch the animated version again. The film’s music acts as a microcosm of this problem. In almost every song from the original movie, they’ve added an orchestral dance break. Those breaks keep the songs from reaching a natural climax and, for anyone who knows the original movie—it is extremely distracting. Yes, the musical numbers look great, but just as you’re getting into them—bam, a sudden drop in energy for a completely unneeded dance number. This happens in the plot as well. When the movie’s remaking the animated version, it’s great—especially thanks to the gorgeous visual flair director Bill Condon manages to fill every frame with. But then, when the plot detours into one of its new, extra scenes, it inevitably clutters up the tighter, better story of the original, and all that visual wonder does nothing to mask it. Belle (Emma Watson), already one of the more fleshed out of the Disney princesses, is also saddled with a completely unnecessary extra back story involving her mother, which actually has less to do with who Belle is and more to do with her father’s actions. The movie could have easily had Belle and the Beast to have bonded over this semi-similar part of their lives. They both learn about each other’s respective parental trauma, but they only seem sympathetic to the other one rather than seeing a kindred spirit. Belle and the Beast “bond” over books—a relationship which begins with the Beast belittling her taste and then mansplaining her favorite story to her. I half-expected him to tell her she should be reading The Catcher in the Rye instead because it just, like, gets it. All of these dramatic character bits don’t land anything like they’re supposed to. And they’re even more jarring because they’re right up against comedic bits that work really well. 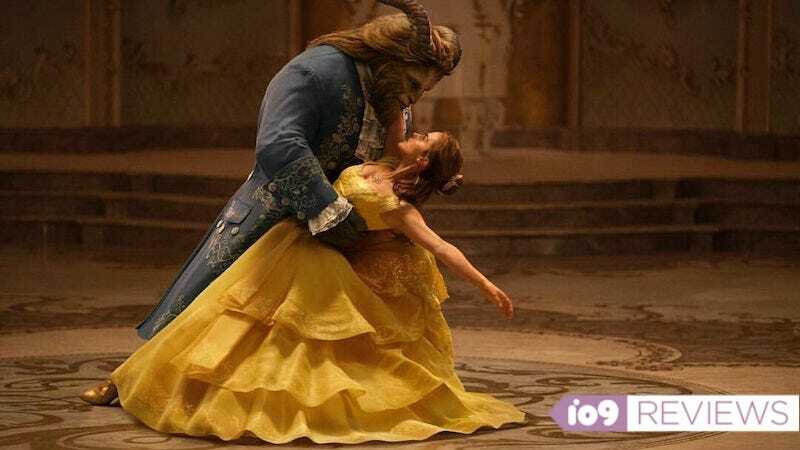 Stevens’ Beast, when he’s acting all awkward with Belle, is approximately a hundred times more endearing than he is when grumping about and singing depressing ballads. Ian McKellen’s Cogsworth has a running gag about his cowardice that gets laughs every time. Kevin Kline, as Belle’s father, has a moment where he realizes exactly what’s going on in the castle that has expert timing. But it’s Luke Evans who is the true joy. He doesn’t just steal the show as Gaston, he cons the movie out from under Watson and Stevens and is halfway across the globe, Josh Gad’s LeFou in tow, before anyone realizes what’s happened. His and Gad do the exchange that comes from the original’s “Gaston (Reprise),” and I swear it’s twice as funny as it was back then. I think Evans might be a real-life cartoon and the fact that he isn’t doing more musical comedies is a crime. There is a lot of talent in the ensemble of this movie: McKellen, McGregor, Thompson, Audra McDonald (Madame Garderobe), Stanley Tucci (Maestro Cadenza), and Gugu Mbatha-Raw (Plumette) are all servants of the Beast. When they get their moments, they’re all great. But they don’t get nearly enough of them. The whole movie is simply less than the sum of its parts. Look, no one’s going to leave the theater demanding their money back. There’s enough going right here that anyone looking for a nostalgia bomb, a date movie, or something to take the kids to will get pretty much what they need. But while Beauty and the Beast is beautiful to look at and absolutely has its moments, you’ll most likely leave wishing you’d seen the animated version again instead.